Every New Year arrives full of possibilities. The changing year gives us a sense of a fresh start and a time to make improvements to our lives. You may feel that this time, things are really going to be different and nothing will stop you from accomplishing your goals. Now that January is here, it’s time to take action. You may have all sorts of ideas to improve your quality of life, like working out or getting a promotion in your professional life, but it’s important to remember that your home is the place where you will spend most of your time this year. It’s difficult to improve your life without having a stable place to work and rest in. Below are eight resolutions for your home this year, in the perfect spirit of new beginnings. They say home is where your heart is, and a lovelier, better organized, and more comfortable place to live will make a world of difference. Most people love to live in a clean house but many dread the act of cleaning itself. Coming up with a solid plan to keep your house clean could be the best thing you do this year. When your home is clean, work can quickly become more productive and your resting time can be truly restful. Create a daily, weekly, and monthly plan to keep your entire house clean. It often works best to focus on one particular type of cleaning at a time. You can wipe windows and mirrors first and then move on to sweeping the floors. Keep cleaning products like sponges, scrapers, cleaning cloths, plastic bags and aprons in a place where you can easily find them. Getting rid of clutter is a must. In fact, it’s probably the best way to feel better about your home. Of course, the act itself can be quite overwhelming, but can you think of a better way to start the year than with a clean and organized home? Keeping your space organized comes down to two things. One is to periodically get rid of the things you don’t use often. The other is to only bring in things that you actually need. 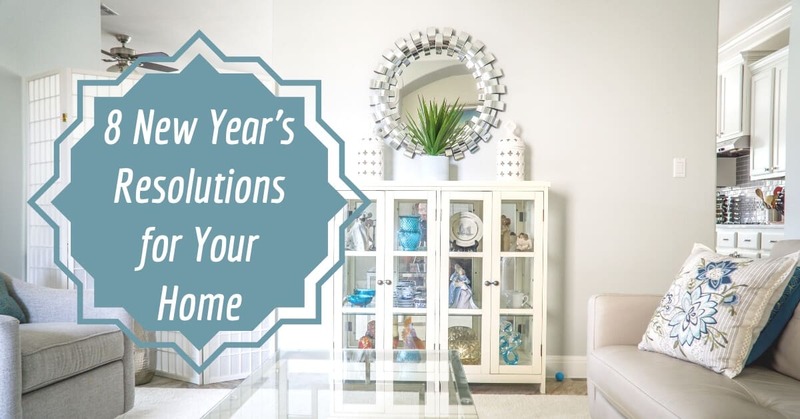 The more organized you can make your space the less time you can spend looking for lost items, and you can get down to the business of making your New Year’s resolutions come true. How about trying your hand at some cool home improvement projects this year with your family? Projects with the family will not only improve your living place, but create a bond with your loved ones. You could try out some DIY projects in this fun, inexpensive, and creative way to spend time together. When finished, you’ll have something elegant to decorate your house with that everyone can take pride in. This could be the year you finally get your finances right. Creating a yearly budget will help a lot. You’ll know how much you’ll need to spend this year and can avoid overspending. Don’t forget to allocate some budget for improvement and maintenance of your house. Cutting down the use of energy will also help a lot, so turn off your air conditioner when you are not at home and dial your heater down to a lower temperature at night. Sound financial health is assured when you don’t overspend. First, check your house for radon. This colorless, odorless gas causes about 21,000 lung cancer deaths each year. Test kits costing as little as $20 at your local hardware store, so there’s no reason to delay. Make sure you install a carbon monoxide detector on every bedroom floor in addition to fire detectors. If a chimney or furnace vent gets blocked or leaks, carbon monoxide could back up in your house and cause illness or death. Indoor air can be full of contaminants like dust, pollen and mold spores. The problem can be even more severe during winter when we prefer to keep our doors and windows shut to stay warm. The harmful irritants in your home can be eliminated by maintaining your HVAC system and changing furnace filters regularly, using low-VOC paints during remodeling of rooms, and using localized ventilation in your bathrooms and kitchens to get rid of smoke, cooking fumes, and surplus humidity. This year, shift your focus towards materials that are low-maintenance and durable. They will provide you with trouble-free service for a long time because you won’t have to spend time maintaining them. For example, if you need to replace your siding, consider using fiber-cement siding which is weather-proof, exceptionally stable, and resistant to fire, dents, and rot. If you have burnt out bulbs, get LED lights that last a phenomenal 18 to 46 years even when they are used for 3 hours every day. Ceramic tiles look extremely good on floors and walls, and also last for decades. We all love spending time outside, but the summers in Arizona are really hot! Spend more time relaxing outside this year in the shade. CC Sun Screens can make your outdoor patio more enjoyable and comfortable in the New Year. Patio shades will enhance your home’s beauty, and can provide shade and privacy when you want it. Contact us for a free consultation!